'Tis the season - for heavy sweaters, leaf raking, Halloween costumes.... and taffy apples. Oh yes, the caramel-coated apple on a stick is a perennial favorite in fall for many people (including me). And as it happens, I live in Niles which is the home base of the Affy Tapple factory. All that sweet goodness, right in my backyard! 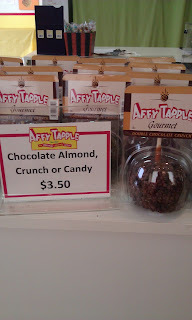 Affy Tapple also has a factory store open to consumers (7425 N. Croname, Niles -- it's tucked away in an industrial district). While the company supplies Affy Tapples to many grocery stores in the Midwest, the factory store here also has some items not available to your local Jewel or Dominick's. Namely, it offers gourmet jumbo apples through its upscale Mrs. Prindable's line. I had one a couple days ago; a large chocolate and nut coated concoction that I cut into pieces and shared with my family for dessert. Delicious! And recently, Affy Tapple just began offering premium chocolates, truffles, toffees and pretzel bites to its lineup. The factory store now has a full display case of chocolate truffles in a variety of flavors (key lime, ancho chile, Irish cream, black cherry, Madagascar vanilla, curry coconut, etc.). I bought a package of pretzel bites - marble-sized round pretzels coated with chocolate and sprinkles...love those, too!